Britain “honored” Jerusalem Day by rejecting media watchdog complaints of its describing Tel Aviv as Israel’s capital. 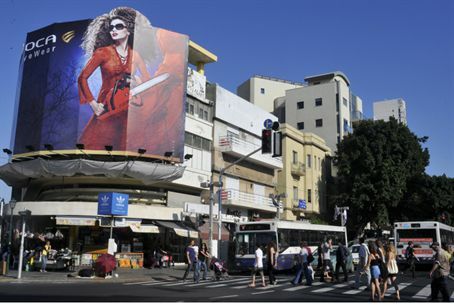 Downtown Tel Aviv - Israel's capital? The British Press Complaints Commission (PCC) “honored” Jerusalem Day by rejecting media watchdog complaints of its describing Tel Aviv as Israel’s capital. The saga began when the London Guardian publicized a correction to the caption under a photograph last April of passengers on Jerusalem’s light railway as they stood in silence on Holocaust Martyrs and Remembrance Day. The caption stated that Jerusalem is the capital of Israel. “Irrespective of whether the international community recognizes Jerusalem as Israel’s capital, it is simply inaccurate to unilaterally confer capital city status on Tel Aviv,” Honest Reporting said on its website. “The terms of Clause 1 (i) of the Code make clear that newspapers ‘must take care not to publish inaccurate, misleading or distorted information,’ and the terms of Clause 1 (ii) state that “a significant inaccuracy, misleading statement or distortion once recognized must be corrected promptly and with due prominence. “In this instance, the Commission noted that the correction published had been a clarification of the newspaper’s earlier claim that Jerusalem was the Israeli capital. The Commission was mindful that while it is correct to say that Israel classes Jerusalem as her capital city, this is not recognized by many countries and those nations enjoying diplomatic relations with Israel have their embassies in Tel Aviv. As such, the Commission was of the view that the newspaper was entitled to refer to Tel Aviv as the capital of Israel. There was no breach of the Code in this instance. Honest Reporting stated on its website after receiving the reply, “This is astonishing and outrageous. Aside from a sovereign state’s right to determine its own capital, international convention maintains that a capital city is usually where a state’s central political institutions reside.